Yeah, a compost posting... again. I don't want folks to get the wrong idea, but this compost bin is not large. It's a 20 gallon garbage pail. I know not a large pile, but it is much better than the earlier compost bin I had which was a white 10-15 gallon kitchen trash can I found on the sidewalk. I began composting soon after settling in here in Truxton, I know this because of the cherry tomatoes. I had a house warming party and a guest (Matt) brought a big bowl of cherry tomatoes from his garden. All the tomatoes didn't get eaten and I tossed them in the small white bin. I used the compost for the front yard and the next Spring got cherry tomatoes growing along my gates. I didn't plant them, so I guess some seed from Matt's tomatoes survived the composting and germinated in the ground. 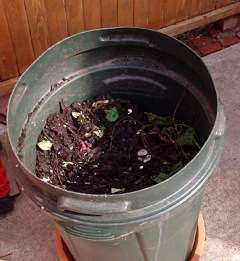 My approach to composting then was toss and sort of ignore. Everyso often I would try turning the compost but it was a square bin and kind of heavy. It sat in the corner of the backyard and was fine until I noticed the stench. I thought it was bums using that area of the alley to go to the bathroom. No, it was my compost. Smelled like a hog farm in July. I knew what my mistakes were. For one, it was left uncovered. I had tried covering the top but got lazier and stopped putting the cover on and water got in and the holes in the bottom of the pail were clogged, so I had standing water. Second, I also failed to turn the compost. Aerating the compost allows oxygen to get in and keep it from stinking. So I used up most of the stinky, but well decomposed, compost in some containers and in the front yard and started a new bin in the green 20 gallon garbage can. The green can is much better. Besides being bigger, it has its own cover, holds more, thus a greater chance to generate heat (a good thing), and its shape allowed me to turn the can by knocking it over on its side and rolling it around. Well once it got a lot of material in it, I had to stop knocking it over, because matter kept escaping and the lid wouldn't stay on. I now have to aerate by going in with the garden claw and turning the compost. The worms don't seem to like it. The aerating and the cover keep down on any stink, but I also try to keep it balanced. Too much nitrogen will make the pile smell like ammonia. So I throw in "browns" like crushed leaves and shredded paper. Although coffee grounds are a "green", the strong coffee(sometimes chocolate) smell, just covers anything else in the pile. The turning and the minimal amount of heat as well as the worms have rewarded me with some lovely looking compost this year. I'm going to mix it in with garden soil and some peat moss, to lighten the dirt, and some sand and add it to the front and the containers. But before I do that I'm going to have to test the dirt I make and see what it needs (more nitrogen? more acid?). I'm excited about this coming Spring and can't wait to get planting. I love your blog. I wish I could write more myself. I wasn't much of a gardener, now I have a Bonsai collection of 10 plants. I got into saving a tree in my backyard from vines.